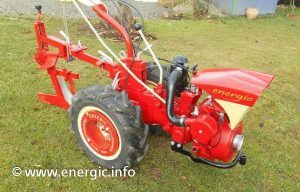 Energic 130 motoculteur Moteur Bernard 239a. Engine/Moteur. 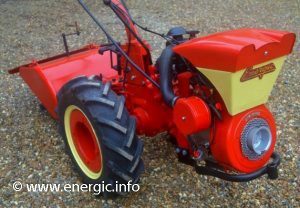 Bernard W239 A 4.5 ch four stroke, Single cylinder, air cooled. Gears. Box Bté S.G.D.G.The 3 speed gear box, (selection 3 slow, 3 rapid). Reverse. 1 speeds are available in reverse. Energic motoculteur 130 motor front view. PTO, 2 both spline. 1 pto normal and the other proportional with the advancement of the machine. Clutch. Centrifugal type.This operated from a lever pulled up under the left hand side of the steering wheel. Exhaust/Silencer. Fitted in a frontal position left hand side, away from the driver. Steering. 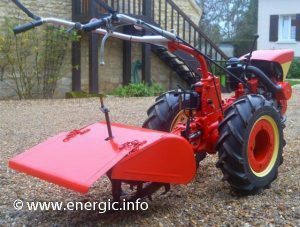 Via handle bars, which can be inverted for use as a snow plow, etc..
Width. regularable between 30cms and 75 cms. Fuel consumption. 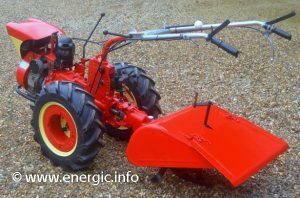 1 to 1 1/2 liters of fuel per hour dependent upon working conditions. the tank holds approx.5 liters. 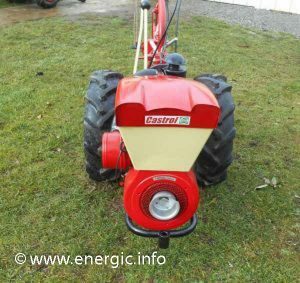 Energic motoculteur 130 motor Bernard 239a side view. Throttle control. Operated from on top of the right hand side handle bar. Adaptions. 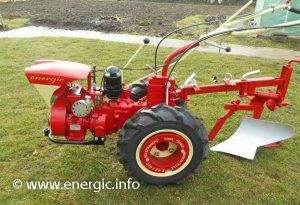 Rotivator/Motobineuse, snow plow, grass cutter, tracteur pulling engine etc.